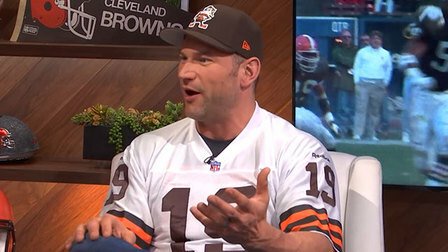 Joe Thomas believes quarterback Baker Mayfield and coach Freddie Kitchens are the perfect leaders for the new-look Cleveland Browns. CLEVELAND — Former Cleveland Browns left tackle Joe Thomas knows well the importance of having good quarterback play, as he blocked for more than two dozen signal-callers during his 11-year NFL career. And that is why Thomas is confident the Browns have the quarterback, Baker Mayfield, that can help All-Pro wide receiver Odell Beckham Jr. adjust to Cleveland without losing any of the productivity he displayed in his five seasons with the New York Giants. 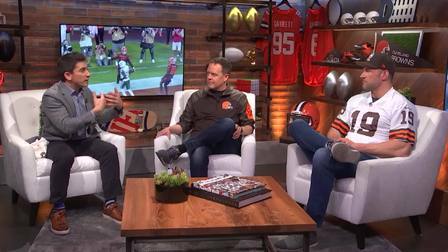 “That was one of the things that John Dorsey was drawn to Baker last year before he drafted him,” Thomas told Andrew Siciliano and Marc Sessler of NFL.com/NFL Network earlier this week. “If you guys remember, right after the season was over, when people just started doing their draft evaluations, Baker wasn’t really at the top of most people’s lists. Slated to be the Browns’ backup for the 2018 season, Mayfield broke the NFL rookie record with his 27th touchdown throw with 3:24 remaining in the fourth quarter of a 26-24 loss to the Baltimore Ravens in an AFC North Division clash at M&T Bank Stadium in Baltimore on December 30. “The reason this locker room will work in Cleveland is because they’re all in the same generation,” Thomas said. “There’s no generation gap like there is in New York with Eli (Manning) and Odell. There was a big gap, and so, when they’re in the locker room and things naturally come up, you don’t have that relationship off the field, but these guys will because they like to hang out with each other. Youth movement: What will this team bring to young Cleveland Browns fans? Along with Mayfield, Thomas is confident new coach Freddie Kitchens will be the right leader for the team despite his inexperience as a head coach. Under Kitchens, the interim offensive coordinator for the second half of the 2018 season, Mayfield completed 180 of his 263 attempts (68.4 percent) for 2,254 yards and 19 touchdowns against eight interceptions. “John Dorsey hired him not just because of the wins and what he did with the offense last year, but also, the personality, his ability to understand or relate to different people and his management of players and coaches,” Thomas said.